Welcome to Ligo Haibun Challenge. We have two topics this week. You may choose either of them for your haibun. Wear the Ligo badge to the right with pride on your blog! 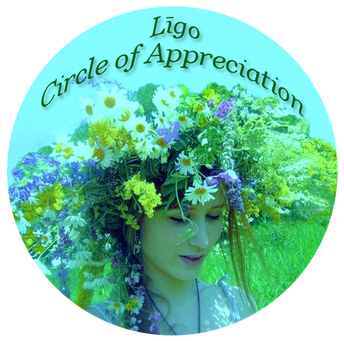 And pin the Circle of Appreciation to your blog if you haibun is selected as a honourable mention! Do add your haibun to the link collection below. Anelephant: A terminally ill patient lives in his make-believe world; of what he wants to see and hear. And a heart-warming haiku in the end. Sunshine: Liquor shatters happiness in a family. A realistic haibun. Glad you liked them, kz. You may select the one you are most comfortable with. Yes, anelephant and Sunshine’s haibun were very good. In fact, all of them were well-written in terms of style and originality. Well, we are not able to decide on the third so far..
Sure, take your time. The first two were good too. Will see if I can do so. Wrote a few haibun last week on other prompts. These prompts sound like we are going to have difficulty deciding which one to choose! Cangrats to all who submitted last week. There are no losers for each one was mighty excellent. The standard is very high on this challenge. AnElephant is touched to be mentioned above. I’d like to give this a try. I’ll think about it. the pain from dysfunctional family members due to their addictions breaks not only the immediate members but indirectly the whole society as well. thank you so much for the kind mention here…so unexpected. i believe all the challenge entries are highlight worthy. thanks, again and to everyone: . ☼sunHUGS!! Hello, So, are you going to write on the first topic? They are somehow interlinked in some ways. It is absolutely fine to write a haibun on both of them. Thank you! Hi Sunshine, have mailed you..
Sunshine, let me know if it works..